Bangladeshi Ambassador to Shahidul Islam visited me at the Advanced Ship Engineering Research Center (ASERC) at Pusan National University (PNU) to find a way of establishing a long-term and mutually beneficial collaboration in the shipbuilding sector between Korea and Bangladesh. At his request, I paid a short visit to Bangladesh on Oct. 12 and 13 last year. 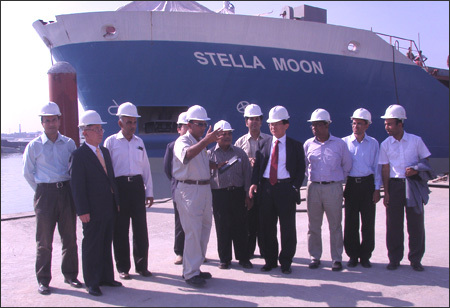 In order to understand the shipbuilding related academic and industrial environment, I visited two leading shipyards namely Western Marine Services (WMS), and Ananda Shipyard and Slipways (ASSL), as well as the Department of Naval Architecture & Marine Engineering (NAME) at Bangladesh University of Engineering and Technology (BUET) and the Marine Academy. I was surprised by the fact that Bangladesh has a strong background in building ships since ancient times. I realized that it is quite natural in that Bangladesh has more than 200 rivers with a total length of about 22,155km plus a long coast line on the Bay of Bengal. It is little known today that Bangladesh was the center of building ocean-going vessels in Asia between the 15th and 17th century. In the early 19th century, the shipyards of Chittagong built many commercial ships of up to 1,000 tons and also British navy vessels that participated in the battle of Trafalgar in 1805. Due to this historic prosperous background and also a natural geographical advantage, there are presently more than 200 shipbuilding and ship-repair yards in Bangladesh. Among them, I visited two, ASSL and WMS, which are the most modern and largest shipyards in Bangladesh. My first impression was that both of them are well organized in terms of production and assembly flow lines, and that the facilities (welding, steel cutting and design office software) and their size (up to about 10,000 tons) were better than I had expected. It was good to note that in NAME, there are a large number of well qualified professors who studied overseas. The students are active, and can speak English very well, which is a very important factor in the shipbuilding industry. However, there were no valuable experimental facilities which can be effectively used in qualitative education and good research. The most important objective of my visit was to establish an academic collaboration between BUET and PNU in the field of naval architecture. An agreement of academic exchanges and cooperation between the two institutions was made in order to encourage faculty and student exchanges and joint research activities. As a result of the agreement, five students from NAME were awarded scholarships to study at the post-graduate level in the Department of NAOE, PNU for the spring semester of 2010. Bangladesh and Korea have similar historical backgrounds in terms of a prosperous culture and technology in the past followed by colonization by foreign powers in recent history. The natural and human resources had dried up when Korea was liberated in 1945 after the Japanese colonial period of 35 years. It achieved total exports of $100 million in 1964 when Ethiopia in Africa and Bolivia in South America also registered the same amount. In 2008, Korea's total exports totaled $426.7 billion, whereas the total export of Ethiopia was at $1.6 billion and Bolivia's, $ 5.7 billion. It is worth mentioning that in 2008, Korean exports in the shipbuilding sector alone came to $43.1 billion (almost three times the total exports of Bangladesh). It is no wonder that whenever I travel and give lectures in foreign countries, I am often asked what factors have made the Korean economy and also its shipbuilding industry develop so fast? My answer is that there may be several factors but the most important of them are two: leadership and education. We had a great leader, the late President Park Chung-hee, who made Korea run in the right direction with a clear aim and vision. When he became the President, he appointed the first presidential economic aide, who studied naval architecture in the U.K., and asked him to draw a road map for shipbuilding prospects. Regarding the importance of education, Korean people are very enthusiastic in learning, and they are prepared to spend all their savings on their children's education. Almost 100 percent of high school graduate students can enter universities if they want. Some of the national universities in Korea have excellent educational and experimental facilities funded by the government. I am very confident in saying that NAME has the most advanced educational facilities in the world. Indeed, Korea has emphasized the development of human resources, which is the most important asset in running organizations including companies and states. The shipbuilding industry needs heavy infrastructural equipment and well trained workers for design and manufacturing. In addition, this industry needs backward and forward linkage industries, steel and electricity businesses, social infrastructure and logistics, and financing support. The most important factor is the strong governmental support and dedication. Various favorable policies by the government should be put in action such as subsidies, R&D and educational investments. Due to the shipbuilding boom worldwide for the last decade or so, Bangladesh shipyards such as the ASSL and WMS benefitted in terms of new ship orders from overseas and also expanding their building capacity. The low-tech oriented ships such as bulk carriers can be built competitively with low labor costs, which is a big advantage in Bangladesh. The shipbuilding is an attractive industry for developing countries that can easily enter the world market. By building such low-tech ships one after another, the skills of workers and technologies are accumulated and improved, and then, high-tech ships can be built. Japan and Korea followed this strategy and now China is following along the same lines. I was impressed to see that already Bangladesh is receiving orders for bulk carriers from some European countries, including Denmark, Germany and Norway. Of course, the labor cost is not attractive anymore in Korean ship yards since it is higher than in Japan. In Korean ship yards that build the most high-tech and high-valued ships in the world such as large containers, FPSO, LNG carriers, LNG RV and deepwater drill ships, the engineering technology with efficiency, high productivity and superior quality plays a significant role in the total cost. The author is a professor at the department of Naval Architecture & Ocean Engineering, and director of the Advanced Ship Engineering Research Center (ASERC) at Pusan National University.